With all of the Christmas parties thrown each year, thinking of a new menu is a challenge. Offering finger foods at your Christmas party allows the guests to mingle and graze on the food throughout the event. Finger foods are generally easier to prepare than a full meal. Many of the finger foods can be prepared ahead of time, which eliminates the need to coordinate the cooking times of all the foods. Sandwiches work well for a Christmas party because you can offer a variety of fillings. This gives all of your guests an option they might like. Egg salad, chicken salad, cold meat and cheese are all common options. If kids will attend the party, include peanut butter and jelly. Hummus sandwiches add a vegetarian option to the sandwich selection. To tie the sandwiches into the Christmas theme, use Christmas-shaped cookie cutters on them. Choose smaller cookie cutters so you can get two or three out of each large sandwich. Smaller sandwiches are also easier to eat and hold as finger food. 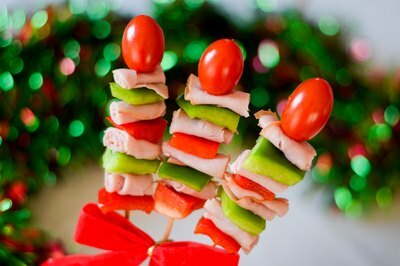 Kabobs work well as party finger food because you can customize them with nearly any type of food you want. The guests easily grab the kabobs when they get hungry. The foods that work best on the kabobs are soft enough to slide onto a kabob stick. Long plastic toothpicks or bamboo skewers cut into shorter lengths work well as sticks. Traditional Christmas meats such as ham and turkey work well on the kabobs. Cut them into bite-sized pieces and alternate them with cheese, vegetables and chunks of bread. Try to include a mixture of red and green vegetables for a Christmas look. Cherry tomatoes, lettuce, and red and green peppers work well. Fruit kabobs offer an option for dessert. Add chunks of pound cake with the fruit for more flavor. 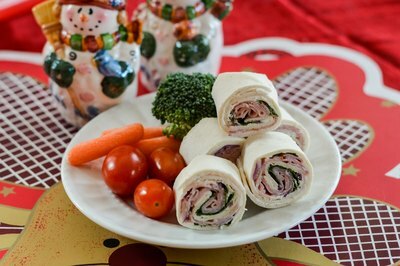 Pinwheel appetizers offer another customizable finger food option for the Christmas party. Pinwheels are made by covering a tortilla with cream cheese-based mixtures filled with different vegetables and food items. The tortilla is then rolled up and cut into half inch slices. Add accents to the cream cheese mixture in red and green for a Christmas look. For the basic cream cheese spread, mix together two 8-oz. blocks with a packet of dry ranch dressing. Add items such as chopped red pepper, green pepper, green olives and green onions to add flavor and color. You can customize the recipe by adding any extra ingredients to make the filling. 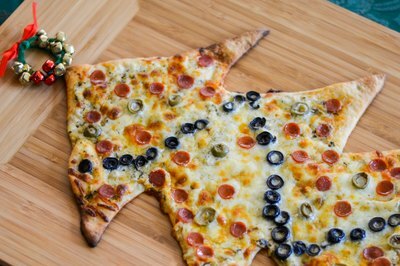 Homemade pizzas in different flavors work well as a Christmas finger food option. Choose red and green toppings such as green onions, green olives, green peppers, red peppers, tomatoes and red onions for the pizzas. Mix and match sauces such as regular pizza sauce, Alfredo sauce and pesto sauce. Mozzarella and feta cheese work well on the pizzas. Cut them into strips or Christmas shapes so they are easier for the guests to hold. 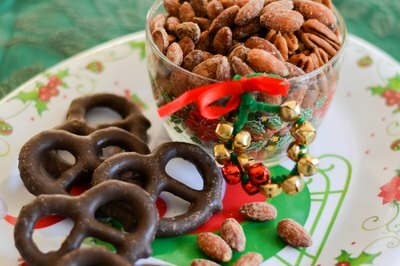 Spiced nuts and chocolate-covered pretzels make a fitting dessert option. Many candy stores sell spiced nuts around the holidays. Look to your local mall for a spiced-nut kiosk if you can't find a candy store. Chocolate-covered pretzels are available at candy stores as well. They are also easy to make at home if you prefer. Use almond bark to dip the pretzels. It comes in both chocolate and vanilla. The almond bark is melted in the microwave and sets up quickly as it dries. Menu ideas for kids' parties including a fruit platter, veggie cups, mini corn dogs, pizza pinwheels and more.